Alev Şahin, a Turkish architect who was fired from her job with a decree issued by the Turish government after a coup attempt in 2016, has been detained for “refusing to stand for the Turkish national anthem,” the Gerçek Gündem news portal reported on Wednesday. According to the report, Şahin refused to stand up for the anthem played during a public demonstration in a square in Turkey’s Düzce province because she was staging a separate sit-in protest against his dismissal by the Turkis government on coup charges. 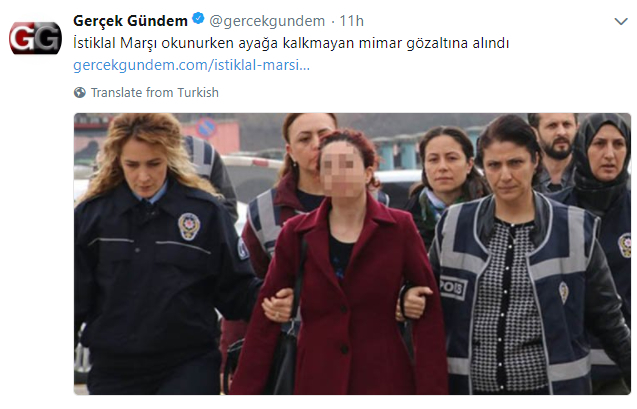 Şahin was detained after organisers of the demonstration complained to police that she had refused to stand for the anthem and Düzce public prosecutor launched an investigation into the incident. Even though the group denies any involvement in the attempt, tens of thousands of civil servants have either been dismissed or arrested over alleged membership in the group. More than 150,000 people including thousands of academics have lost their jobs over links to the group since summer 2016.